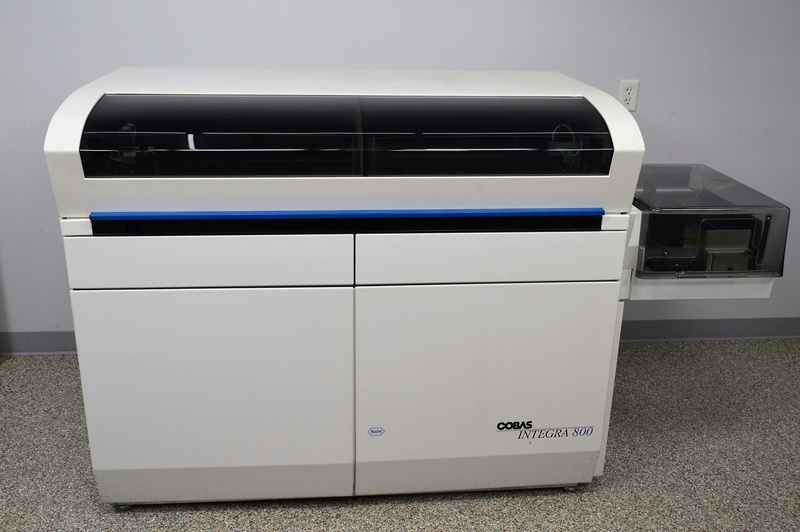 COBAS INTEGRA 800 Chemistry Analyzer Sample Management System w/ PC & Extras . New Life Scientific, Inc. This Roche Cobas Integra 800 Chemistry analyzer is in very good cosmetic condition, with only minor wear from normal use and age. New Life Scientific technicians have tested this system and were able to confirm that it is in good working condition, and that the system was properly drained and disinfected before being taken out of use. NLS technicians were not able to fully initialize the system due to not having enough probes to do so, but they were able to initialize one sample arm at a time(testing all three) to confirm that they all are functional. The reagent arms were not fully tested but were confirmed to be moving properly. -computer, external CD drive, mouse, keyboard, monitor, and all associated cables. Misc. Parts including but not limited to O-Rings, caps, bar codes, and more. Please note that shipping locks have been installed and will need to be removed before use. The user name and password to the computer is unknown but was not needed to perform various tests.